2) Sally Hansen No More Mistakes Clean Up Pen - I don't think this one worked too well and dried out really quick. Not a repurchase. 3) EOS lip balm in Vanilla (from LTD collection) - Love these things and I have so many that I don't need to repurchase for a long while but I definitely recommend them! 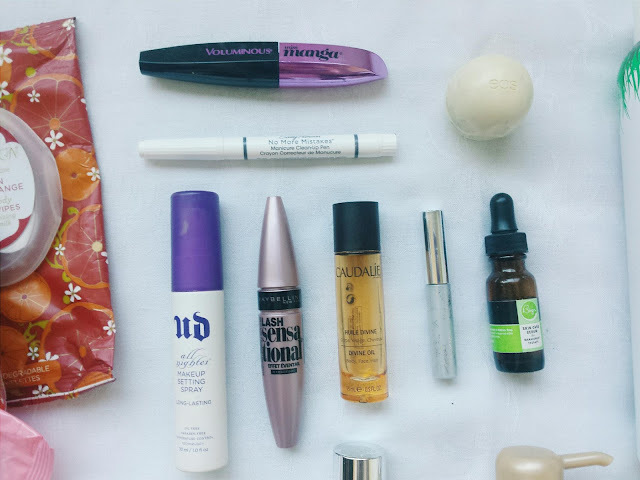 4) UD All Nighter Setting Spray - Loved this and the size of this travel one. I don't wear makeup often so this lasted a long time but when I did use it, it set my makeup really well! I highly recommend it and will be repurchasing soon! 5) Maybelline Lash Sensational Mascara - I really wanted to like this but this didn't do it for me. The formula was really dry (maybe it was just my tube) and it clumped pretty easily. Not sure if I would repurchase or not, but most likely not. 6) Caudalie Divine Oil - I really liked this stuff and tried the mini travel size of it. I used it on my face, body, and hair and it worked well for all parts and smelled really nice. It absorbed well and didn't feel greasy. I would recommend it and may consider buying the full size. 7) Clinique Bottom Lash Mascara - I found a lot of use of this mini mascara, not only for my bottom lashes but also on the hard to reach lashes and corners on the top lid. I recommend it and plan to repurchase soon! 8) Biozn Skin Care Serum - This product made a big difference to my skin especially when I was dealing with eczema. I love it and will repurchase it. 9) Pacifica Tuscan Blood Orange Body Wash - This smelled great and was a good body wish. My skin didn't feel stripped of the oils afterwards or anything. I wouldn't repurchase it right away but is something I would definitely look into getting again. 10) Olay Fresh Effects Out of this Swirld Deep Pore Clean & Exfoliating Scrub -The swirl was cool and it smelled nice. This was decent but I wish the exfoliating part was a bit more..rough, if that makes sense. I probably won't repurchase it. 11) DHC Olive Virgin Oil - This was a great moisturizer and didn't have that strong 'olive' note you get from regular cooking olive oil. 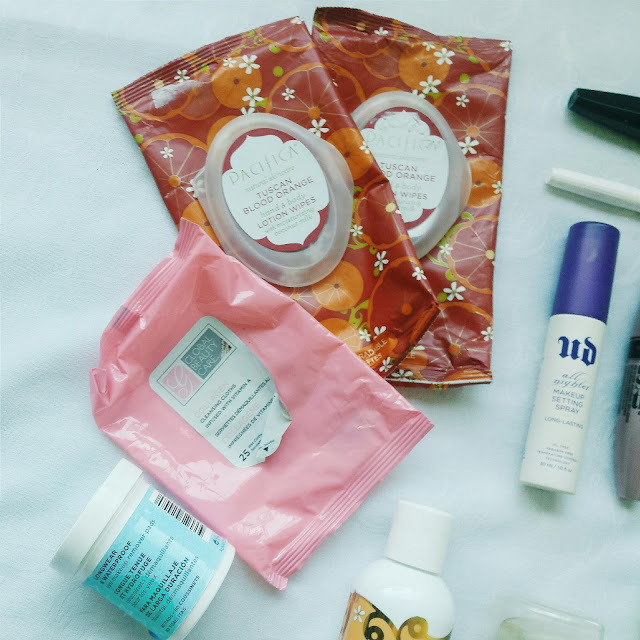 If it wasn't so expensive I would repurchase more often but I think I would only repurchase when my skin feels really dry, maybe more towards the colder months. 12) Eucerin Q10 Anti-Wrinkle Sensitive Skin Lotion - I mainly got this for the Q10 and sensitive skin aspect, but preventative care is important too. I love this moisturizer and my skin reacted realyl well to it. I would highly recommend it for sensitive skin/eczema prone skin and would repurchase this! Plus is has SPF in it. 13) Kracie Aroma Resort Body Soap in Happy Sweet Peach - I really enjoyed it as a body wash but found myself using a lot more of it than I do with other body washes. The price is a bit on the higher spectrum compared to drug store prices so I probably wouldn't repurchase this but did enjoy it. 15) Almay Longwear & Waterproof Eye makeup removing pads - These work great and I love the container they come in with the soaked pads. I have repurchased these a couple of times already and will continue to. 16) Global Beauty Care Collagen Cleansing Cloths - I bought these since I saw them on sale and was happy with how they worked. I didn't quite notice a 'collagen' effect on my skin but my skin did feel clean after using them. I don't think I would necessarily repurchase but would recommend them. 17) Pacifica Tuscan Blood Orange Lotion Wipes - These are great and the whole idea behind them is genius. They smell good and are easy to carry around and perfect for after working out or a refresher during a hot day. They do tend to dry out a bit so make sure you secure the closure properly. I would repurchase these. 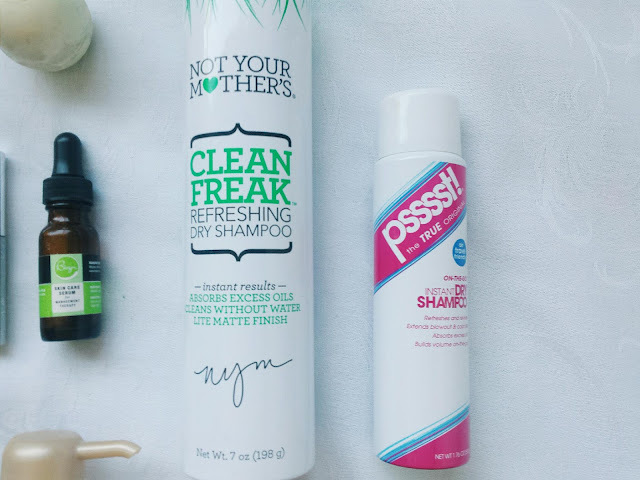 18) NYM Clean Freak Refreshing Dry Shampoo - I wish I liked this more since this is a pretty big bottle. I was fine with it during the first half of the bottle but then found I got annoyed with the smell. As a dry shampoo, it worked decently so if you are looking for a new dry shampoo I would recommend it. I just don't think i'd personally repurchase it. 19) Psssst! Dry Shampoo - I liked this travel size, perfect amount and easy to travel with. This one I enjoyed till the very bottom of the can where it just started to spray white powder onto my hair and that's not a good look for my dark hair. I would repurchase though and keep in mind shaking it even more before use. That's it for the empties. Sorry for the long post, I just kept hoarding all the empties and forgot about them, hehe. 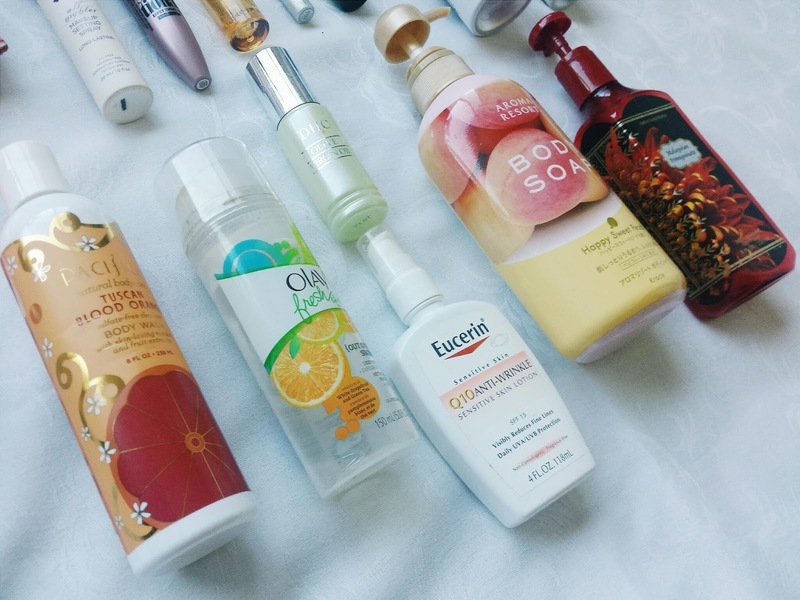 Readers, have you tried any of these products before? 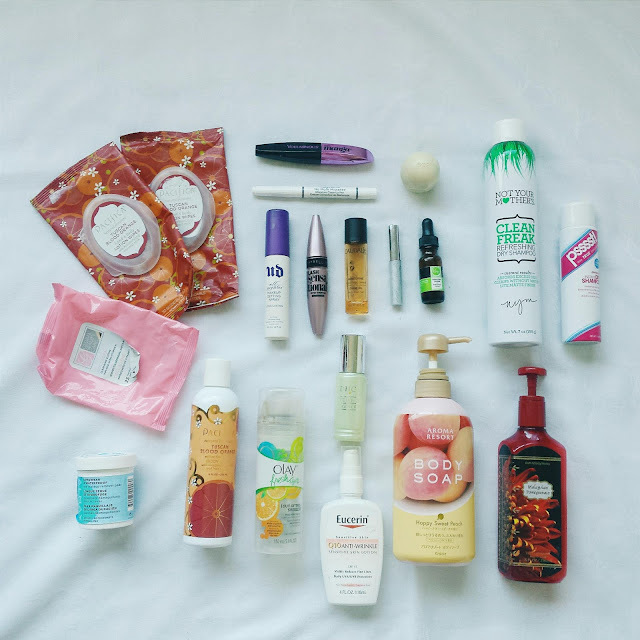 Any empties you always repurchase? Great post- thank you!! I had the NYM dry shampoo but not a huge fan- I like the Dove refresh+care way better from the drugstore. They're great and yes perfect for the beach of post workout!